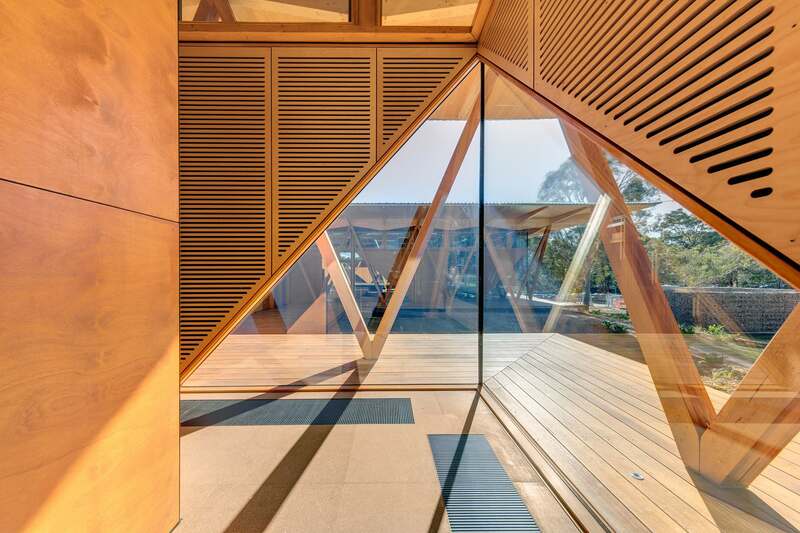 Macquarie University Innovation Hub is the 2017 winner of the Australian Timber Design Awards in multiple categories: Innovative Structural Design; Engineered Timber Products; Timber Panels; and Timber Windows and Doors. 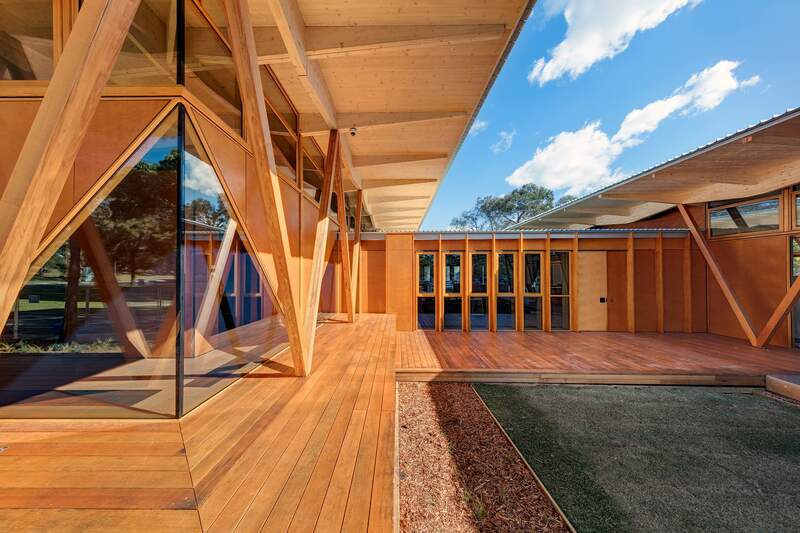 This is an ambitious, well-crafted building whose design allows for future dismantling, relocation and reassembly. 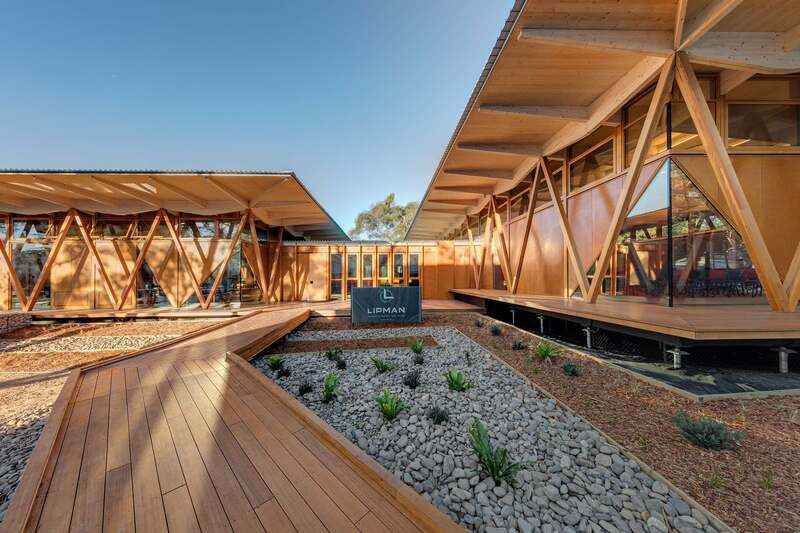 Macquarie University Innovation Hub is an ambitious, well-crafted building enabled by an aspirational client and a unique collaboration of design professionals. 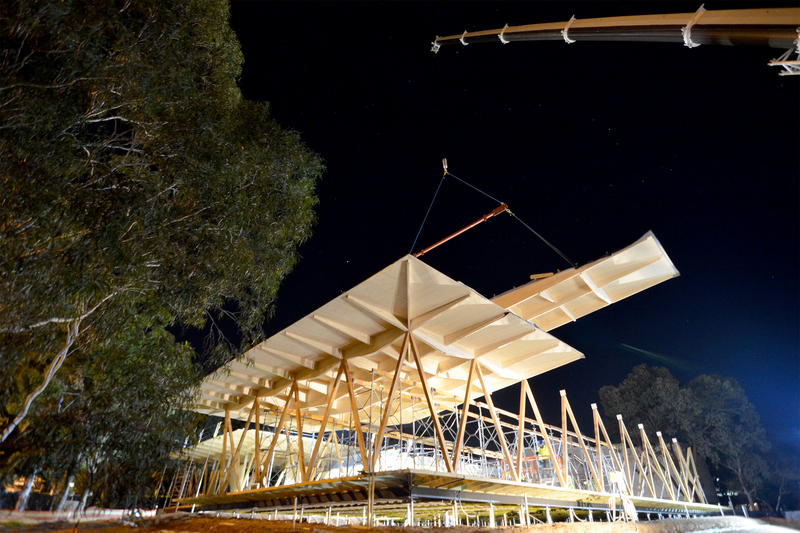 The brief required a prefabricated timber structure to enable future dismantle relocation and reassembly. Project deadlines necessitated fast-tracked construction which the team achieved through design for manufacture and assembly. 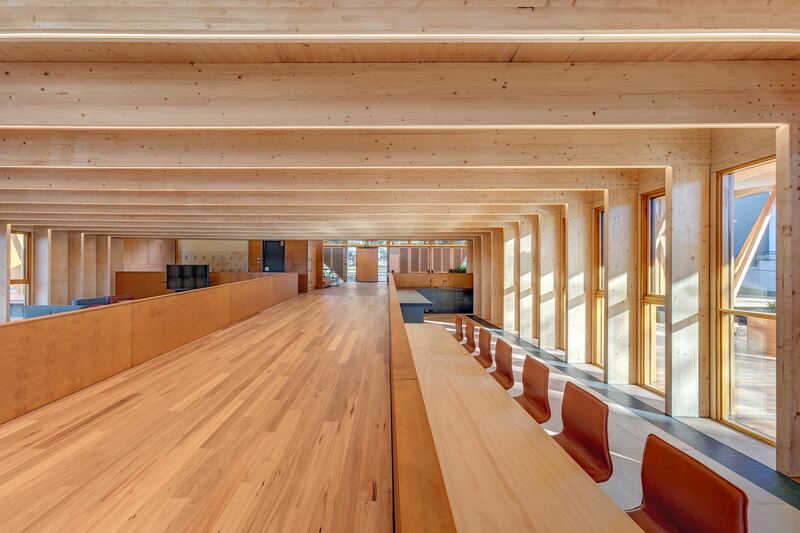 The internal spaces are tactile and characteristically warm, and the natural aroma of this timber palette is a pleasure for its users. The unique and striking facade paneling is both uniquely detailed and an example of exemplary craftsmanship. 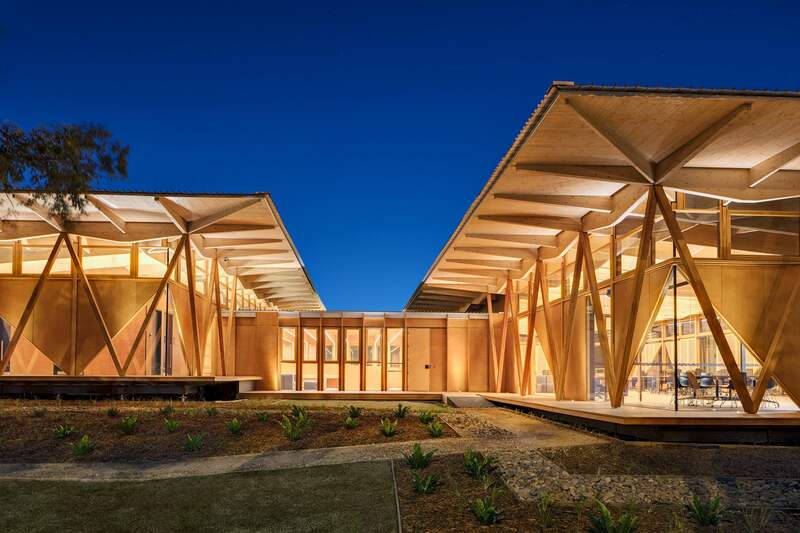 Engineered timber products were specified because they aligned well with project requirements for innovation, prefabrication, fast-tracked construction and small construction tolerances. 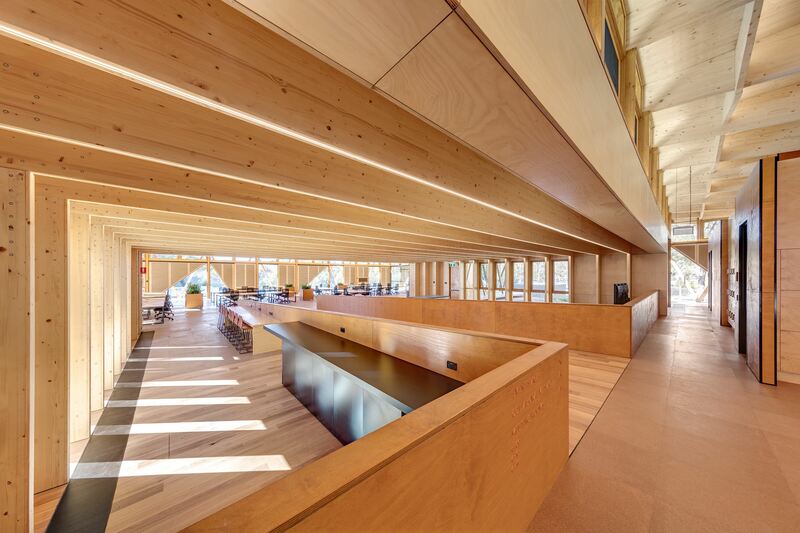 Engineered timber products were also specified for their appearance. 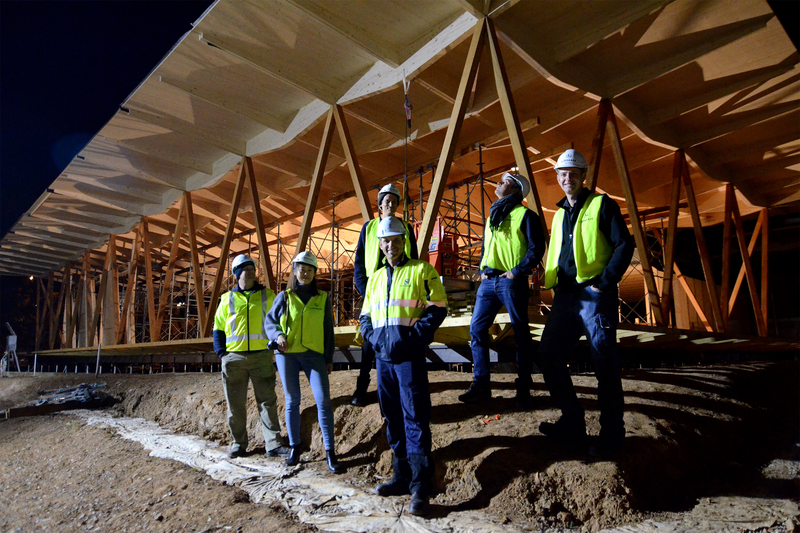 There were procurement and quality benefits associated with a glulam structure when compared to an LVL alternative. The floor is constructed using engineered floor cassettes which are made predominantly of solid timber and OSB floor sheets with H3 treated LVL used as bearers in critical structural locations. The roof is constructed with engineered roof cassettes. 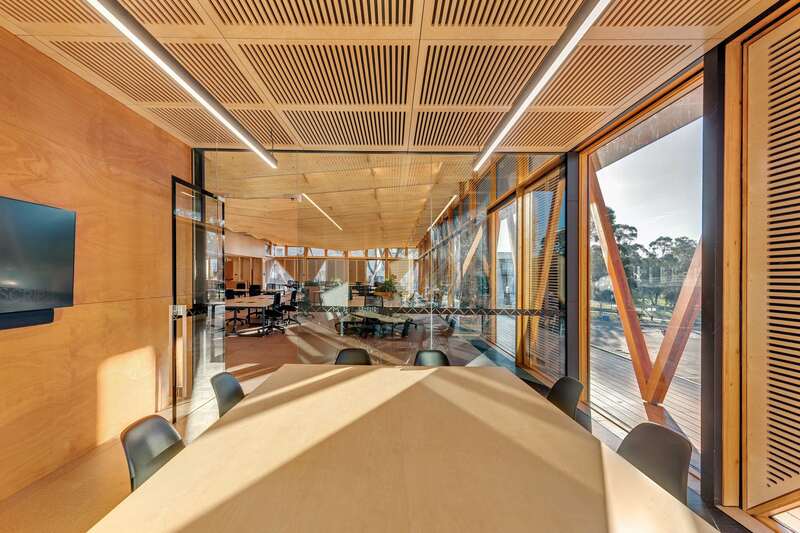 Primary and secondary beams are spruce glulam with flitch plates at critical connections. 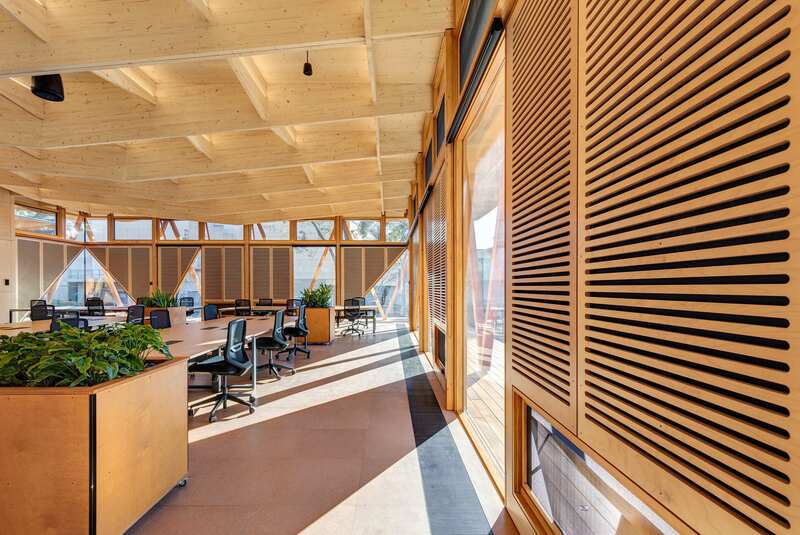 The roof diaphragm is 27mm Binderholz 3-ply (CLT). 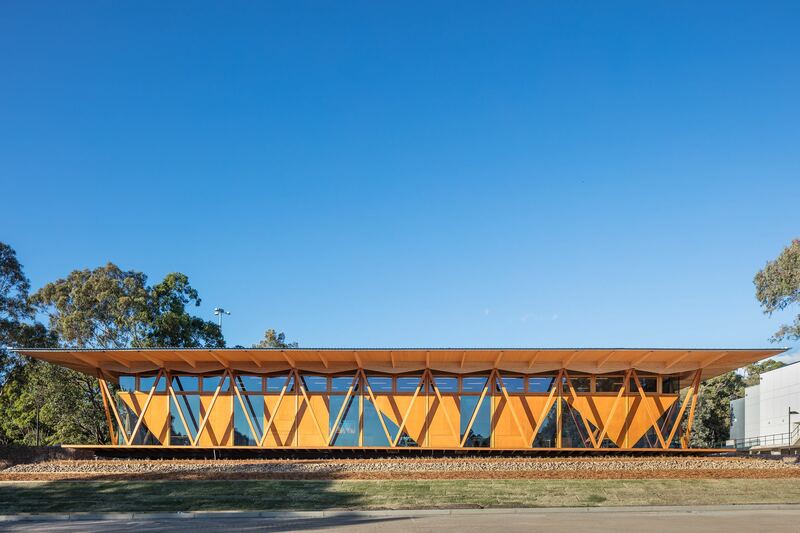 V-columns are Victorian iron ash glulam with flitch plates at structural connections. 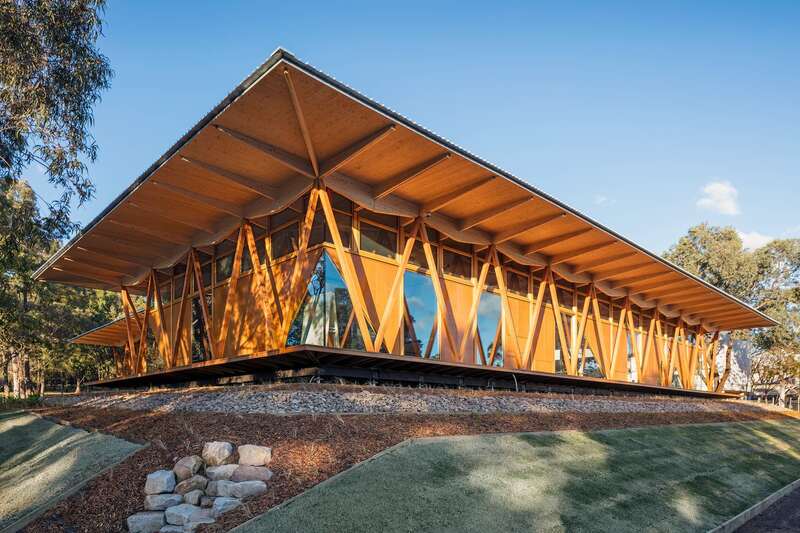 Structural transoms and mullions of the facade are spruce glulam with concealed rebates for services reticulation. Diagonal members of the prefabricated facade panels are LVL. 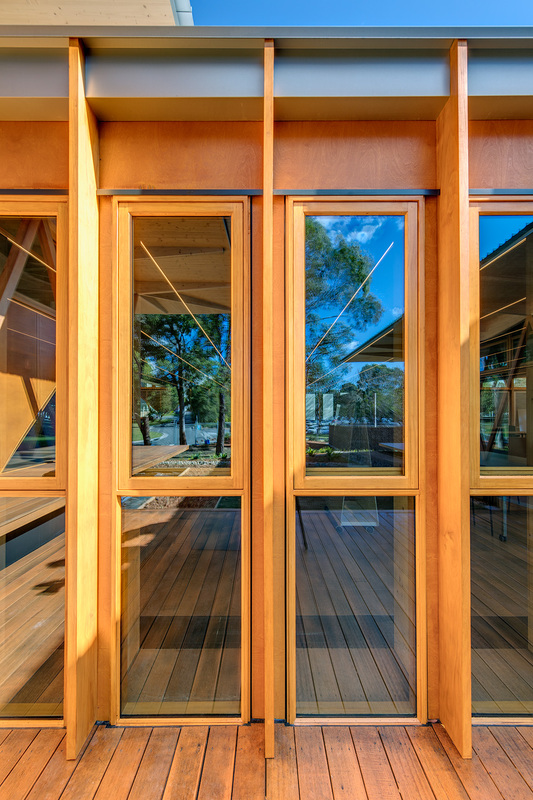 Fixed, double glazed timber windows are installed to all facades of the pavilions below the structural transom. Operable ventilation hatches are also integrated into the non-glazed areas of the facade which are ply lined awning sashes. Double glazed awning windows with fixed highlights are installed above structural transom of pavilion facades. Pavilion corners are silicone jointed fixed glazing with a concealed 16mm stainless steel post between the double glazing of the highlights. The link windows are double glazed awning windows with fixed lights. All operable windows are controlled by actuators that are connected to the building managment control system. External facade panels have been detailed with an 8mm shadow line at joints Vertical joints have an accoya tongue to conceal the building membrane and improve weatherproofing. Panels are fixed with exposed SPAX-D screws. Tolerances to the panelling are +/- 1mm. Timber windows and doors were used because they aligned with program, procurement and value managment objectives for the project. 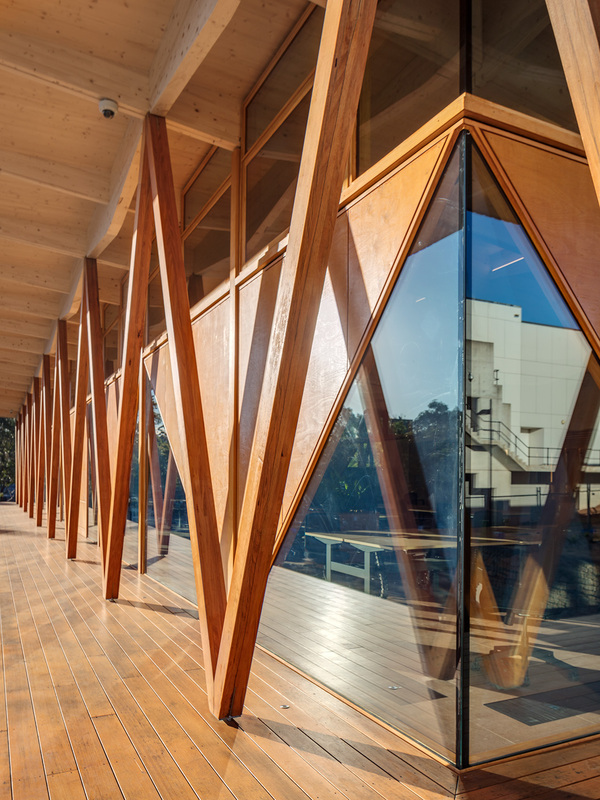 The design team was able to successfully integrate timber windows and door into a panelised timber facade which increased prefabrication and expedited procurement of the whole facade solution. 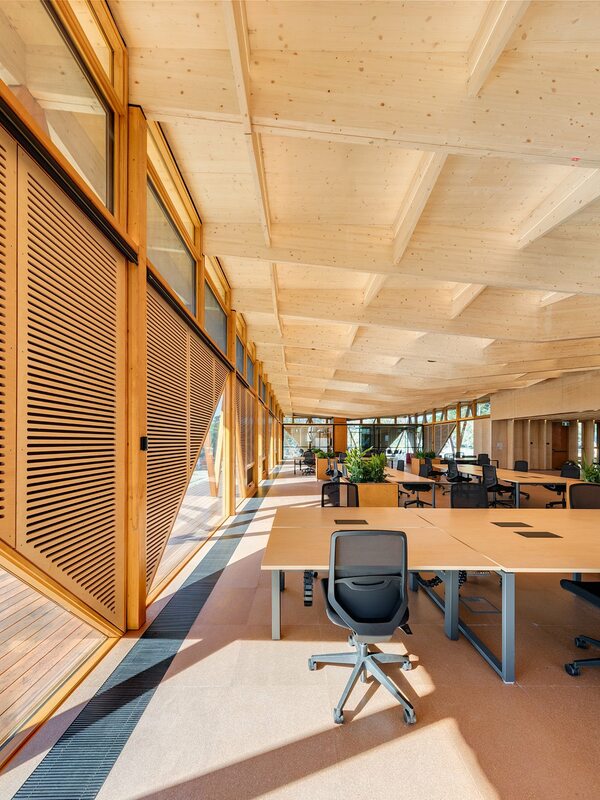 Accoya also aligned well with innovation and sustainability objectives for the project. Victorian iron ash decking is direct fixed to external deck cassettes. Both the deck cassettes and the decking boards are H3 treated. Floor cassettes were selected for their ability to be prefabricated, speed of construction, achievable tolerances and the possibility for future dismantle. They were a cost effective, efficient and robust solution. Victorian iron ash decking was selected because it is consistent with the material of the external V-columns and it is particularly suitable for the application because it is H3 treated. The decking has been carefully installed all fasteners have been consistently set out and discretely finished. Returns have been carefully mitred and the craftsmanship of all decks is exemplary. Internally, facade panels are CNC cut and perforated with a custom slot pattern to suit the facade geometry and reduce reverberation times within the space. 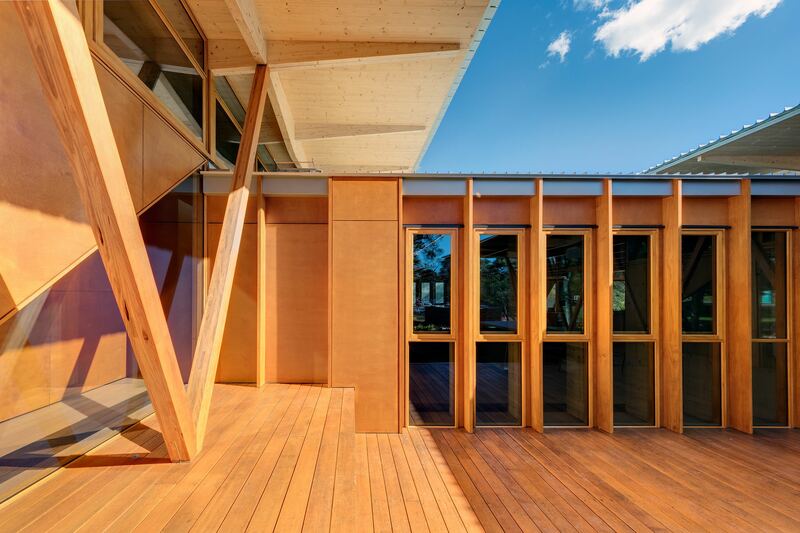 Coordination between Against the Grain Windows and Doors, and Ultraflex Paneling was outstanding. Panel outlines were provided by Against the Grain Windows and Doors. Ultraflex Paneling detailed the slot pattern within geometry provided and coordinated the perforation pattern with wall mounted services. Perforated internal panels are sealed on all sides and backed with Megasorber acoustic fabric. 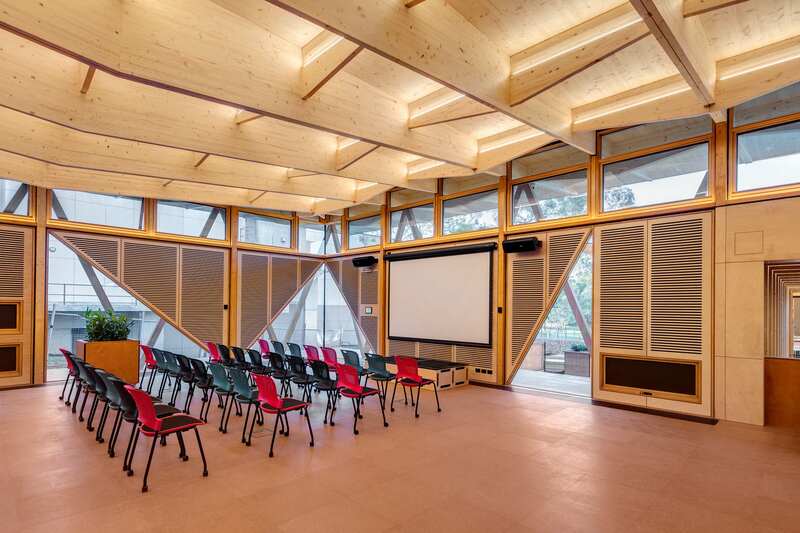 The design was developed on a very tight program with noteworthy input from ARUP Acoustics.